An everlasting domain name registration? Patent application describes a way to ensure enough income to renew a domain name long term. 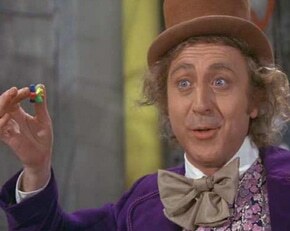 Willy Wonka will protect this formula! You can’t register or renew a gTLD with the registry for more than ten years in advance. Why this policy is in place, I don’t know. But some people would like to secure their domains for much longer than ten years. Network Solutions has offered a service for a 100-year registration, in which it maxes out the ten-year registration and then renews for another year each year. Is there a better way? Two people in Dallas think so. The idea is akin to a financial instrument that throws off income each year to cover expenses. If you wanted to ensure your domain will be registered continuously for 100 years, you can calculate how much money you’d need to invest to cover annual renewal fees. But it’s more complicated than that. Unlike a financial instrument that you want to create a set amount of distribution each year, the price of a domain name will change in the future. The patent application accounts for this by estimating annual increases in the cost of domain registration and ICANN’s tax. I certainly wouldn’t bet on how much a .com domain registration and ICANN’s fees will be 25 years from now, which is where I think the idea breaks down. It also seems like a complicated answer to a problem that isn’t all that pervasive. Now that sounds like a great idea. A bulk year discount in blocks of 10+ years each would be a nice extended registration incentive as well. Right now, I’m in the middle of a job for a client where the domain name they want for their startup is owned by a man whose funeral took place last January. (Well, probably. The domain is under privacy; so all we can do is guess.) Moreover, the domain was never actually used; and the company that would have used it is defunct. In the future, instead of expiring and re-entering the market, maybe that domain will be renewed eternally, remaining forever inaccessible. Attorney Karl Kronenberger obtained his kronenberger.com domain name by filing a cybersquatting complaint against the deceased real estate agent (named Kronenberger) who had registered and been using the name for his real estate business. All’s fair in love and war and the domain industry, I suppose. Sounds great to me. It will make life really easier for businesses. This would help a lot of people and save A LOT of time. Years. Especially if prices have increased over that time. I havent read the fine print. You only win if they remain in business for that long. Great idea. I’m in! How come NetSol is the only company offering a 10 year deal? Why don’t the others offer and improve on this?